We've had a wonderful few days in Zipolite. It's a picture perfect tropical beach that would be so easy to just stay forever! About a mile of pale soft sand and crashing waves. A small cobbled or dirt road Mexican village backs the beach and all the buildings are just simple palapa shelters and huts. There are dozens of cabanas and palapa huts for rent to stay in right on the beach. 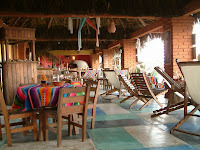 We've got a great little place - a row of quiant cabanas attched to a palapa restaurant bar. There are shaded verandas and hammocks hanging from every available post and beam, 4 poster beds with mosquito nets hanging from them and brightly coloured Mexican rugs, throws and tableclothes making it cheery and welcoming. And all for $20 a night! In addition they serve mean wood fired pizzas and their 2x1 happy hour cocktails are available from sunset till closing!! Today we took a short hike through the jungle up and over the headland at the end of this bay and into the next bay and beach. A much quieter place there's no development and just a couple of dusty trails to access it. The waves here were slightly less menacing than on Playa Zipolite so we had a good cool down before the hike back.